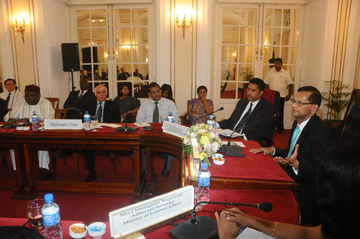 Addressing a group of Colombo based Ambassadors on the recent disturbances, External Affairs Minister Prof. G.L. Peiris said that the events in its internal dimension was a direct attempt to alienate the Muslim community from the government while the external expression of this campaign has as its objective the purpose of driving a wedge between Sri Lanka and Muslim countries, with a view to weakening Sri Lanka in international fora. He said the skillfully conceived and co-ordinated character of the campaign is apparent, and substantial funding as well as other forms of material support from foreign sources is also in evidence. The redeeming feature, he pointed out, is that mainstream opinion in both the Sinhala and the Muslim communities is moderate and reasonable, and strongly opposed to violence in any form. This is the product, he said, of a long tradition of mutually reliant co-existence of the Sinhala and Muslim communities in the towns and villages of Sri Lanka in a spirit of total empathy, participating freely in each other’s social events. Pre-emptive action was taken in the form of arresting persons resorting to provocative conduct or being found with material which could have been used to disrupt the peace. While the immediate requirement was, of course, the establishment of order, the government attaches great importance to measures designed to thwart the actions of small minority intent on creating religious discord. With this objective in view, a vigorous civil society campaign involving the business community, professionals, organisations and academics is being organised to ensure amity,” he said. A vicious campaign is being carried out to malign the government, This campaign, he elaborated, has two aspects. The minister met with the group of Ambassadors and High Commissioners at the ministry for a discussion on current issues. External Affairs Minister Prof. G.L. 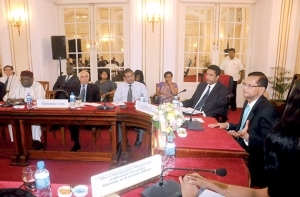 Peiris addressing a group of Colombo based Ambassadors on the recent disturbances. He said a country that has paid a heavy price for communal discord over a period of three decades, will certainly resist with all the energy at its command, any effort by fringe mischievous elements to promote divisions and antagonisms. The minister referred to the attempts in some quarters to derive partisan political advantage from recent events and to resort to actions which are entirely counterproductive. This is a situation in which sectarian political and other interests must yield to the far greater collective interest in harmony and solidarity, he said. The disruptive elements consist of an extremist fringe on both sides, and it is necessary to be balanced in any proper appraisal of the situation, Prof. Peiris said. The minister said that he was with President Mahinda Rajapaksa when news of some disturbing events first reached the President in Bolivia. He described the prompt action taken by the President in getting in touch with religious leaders, the security establishment and the political authority. Leaders of parties within the government rushed to the scene and played a significant part in calming passions and bringing about understanding. Prof. Peiris expressed particular appreciation of the salutary initiatives by prominent Buddhist monks and the moulavis in assembling as a matter of urgency and restoring clam. He said that the law enforcement authorities were rapidly deployed to bring the situation under control. To assist the Police, the Army was called out initially in Alutgama and Beruwala, and subsequently in Welipenna and Matugama. While about 60 persons were arrested, 47 were retained in custody. The government, in terms of the overall national interest and event its own political interest, has the strongest motive to prevent disharmony, and any suggestion to the contrary is both malicious and unfounded, Minister Peiris said. Sri Lanka’s legislation, the minister pointed out, contains ample provision against statements or behaviour intended to cause religious discord. He cited, as examples, provisions in the Penal Code as well as the specific terms of section 3 of the International Convention on Civil and Political Rights Act, passed by the Parliament of Sri Lanka in 2007. He added that strict instructions have been given to the Police not to permit any rallies or demonstrations which contravene these laws. The need for an objective approach, the minister said, is underlined by the fact that both communities regrettably suffered harm in the recent events, so that a determined effort across the board to prevent their recurrence is of urgent importance. The External Affairs Minister emphasised that these are issues which must be resolved within the country and that any move to invite external intervention, although it may appear superficially attractive to some, would in fact prove disastrous for all. 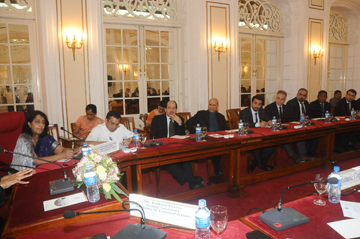 The envoys participated in a discussion with the minister. The discussion was attended by Aziz Ahmadzada, Ambassador of Afghanistan, Harimawan Suyitno, Ambassador of Indonesia, Kahtan Taha Khalaf, Ambassador of Iraq, Zuhair Zaid, Ambassador of Palestine, Abdulaziz Jammaz, Ambassador of Saudi Arabia, Iskander Kemal Okyay, Ambassador of Turkey, Abudlhamid Al Mulla, Ambassador of the United Arab Emirates, Mohammed Sufiur Rahman, High Commissioner of Bangladesh, Azmi Zainuddin, High Commissioner of Malaysia, S.K. Ahmed, High Commissioner of Nigeria, Major-General Qasim Qureshi, High Commissioner of Pakistan, Reham Alfeqig, Deputy Head of Mission of Egypt, Ebrahim Khari, Charge d’ Affaires of Iran, Ahmad Almairi, Charge d’ Affaires Kuwait, Kamal Benalashnar, Charge d’ Affaires of Libya, Rajab Al-Habshi, Charge d’ Affaires of Oman, and Dr. Hassan Niyaz, Deputy High Commissioner of the Maldives. He NEVER mentions the rapid spread of Islam in Sri Lanka is ALSO WELL FUNDED AND COORDINATED. He does not mention that this well funded and coordinated spread of Islam is AT THE COST OF BUDDHISM IN SRI LANKA. He never mentions that Buddhism is giving way to Islam in Sri Lanka and by that is tearing the Buddhist culture apart. Eventually it will supplant it. Why should he? From Colombo to the Muslim nations have to date done an excellent job in raising the percentage of Muslims in Sri Lanka to an impressive 10%. Agree with Mr. Bernard Wijesinhe totally. Colombo is full of Islam & Hindu kovils and as such the population is somewhat accustomed to living in the biggest city, with all the comfort of amenities. No harm in living in any part, but gradualy BUDHISM as a religion practiced by majority will become a minority religion. The list of ambassodors & High Commissioners is ample proof that Mulim & Arab countries are well represented. I am glad at least the police force has taken the iniitiative in NOT JUMPING to conclusions and be trigger happy like in other parts of the world. Just one example, that monk who cut himself to provoke & get the maximum impact against the Buddhists. To find out from Police & then by the monk himself, that HE ALONE acted & self inflicted these wounds. Some Sinahalese will BURST into action thinking that the BBS or ultra nationalists must have done this. GLAD that armed forces & police are there to safegurad the community being flared up. Ploiticians of all stripes are always trying to get the utmost publicity, becaus ethey are playing to the selected constituents. There are many conspiracy theories that will float around but it’s up to the Muslims in the country to get on with the majority without falling into such schemes that may have hatched by out siders.GOSL must rein in it’s our own indigenous nationalists that may use the main religion to harass the people. Who knows if the people of the majority religion is manipulated by foreign meddlers, as they doing that well in Burma? This entry was posted on Tuesday, June 24th, 2014. You can follow any responses to this entry through the RSS 2.0 feed. You can skip to the end and leave a response.